Movies can be a fantastic way to relax, entertain yourself, and get the most out of your lazy days. To make things better, you can use any of your iOS devices to stream your movies so that if you want, you can relax in an environment which you’re comfortable in (or even outside) which you don’t have a TV located in. In this article, we’ll be discussing how to download movies to iPhone. Below we have detailed some of the best and legal websites that allow you to download movies to your computer, which you can then transfer over to your iPhone and watch on-the-go. Download free movies from these websites first, and follow the next part to move the movie to your iPhone. Crackle is an online streaming service created by Sony. From this website, you’re able to browse all of their free content which you don’t have to pay for. Some of the content is available for download, although not all of it is. This website has more than the other websites to offer – movies such as The Grudge 2, Chris and Jack, and Now You See it can be watched. Some of the videos from this website are hosted on YouTube, making it possible to download them. Next, PopcornFlix – not to be confused with PopCorn Time, another streaming platform – is a great website to watch movies on. While you aren’t able to download movies, they have a wide selection of foreign, animation, and thriller movies. Unfortunately, Hulu hasn't yet added a download feature for their content although there are a few different Hulu converters out there. If you find a Hulu video that you want to download, use one of these websites. Recently, YouTube Have added the ability to download YouTube videos through their mobile app and if you have purchased a movie from YouTube, you can use the app to download it on your iPhone. While YouTube doesn't allow you to download movies on a computer, you can use a YouTube converter to do so. Once you download the free movies, transfer them to your iPhone so that you can enjoy them on the go. As iTunes is so confusing to use, here we introduce you another movie transfer software called iMyFone TunesMate iPhone Transfer. 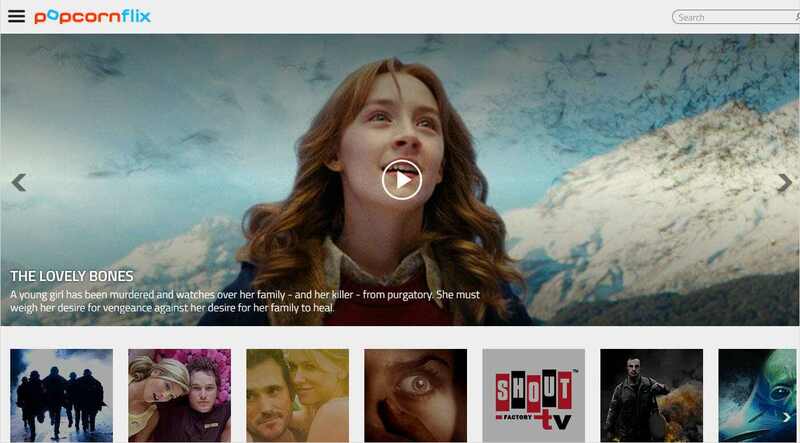 With it, you can download purchased or non-purchased movie to computer without any limits. It’s also recommended by lots of famous media, like Geekreply, tricksworldzz.com, etc. With it, not only can you easily download a movie to my iPhone, but also download music, playlists, podcasts, audiobooks, music video, iTunes U, etc. No Data Loss: Sync computer or iTunes movies to iPhone without deleting existing data. 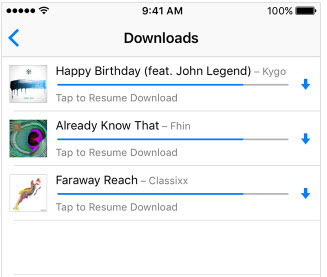 Purchases & Non-Purchases: Transfer files from/to iPhone, which supports purchased and non-purchased files. Two-Way Transfer: Freely transfer movies between iPhone and computer/iTunes. Unlimited Devices: It supports to transfer to or from unlimited iOS devices. Free Trial: You can transfer 5 movies to iPhone for free. If you need more, just register it. Step 1: Start by downloading, launching, and installing iMyFone TunesMate on your computer. Connect your iPhone to it. 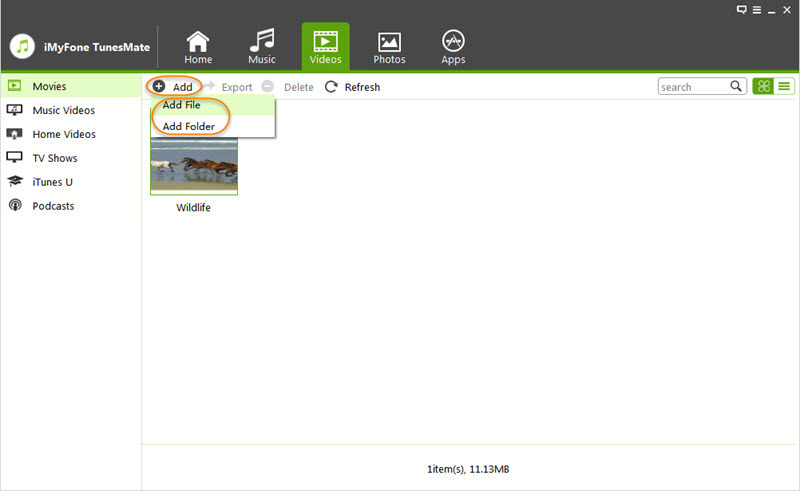 Step 2: From the main menu, click on the “Videos” tab. Click on “Add > Add File”, and locate the movie that you want to have transferred. Select the movie and click “Open”. If you want to download movies to iPhone from iTunes library, you can use “Transfer iTunes Media to iDevice”. Rather than waste your time with troubling and frustrating programs like iTunes, take control and use iMyFone TunesMate. No longer will you have to worry about your valuable data corrupting. Is TunesMate Better Than iTunes? If you want to redownload purchased movies straight to your iPhone, follow the steps below. Step 1. Unlock your iPhone and tap on the “iTunes Store” app. Step 2. Using the menu at the bottom, tap on “More > Purchased”. Step 3. Tap Movies and then tap on “Not on This Device” to view the movies that aren’t already downloaded. Step 4. Locate the movie that you want to download and tap on the iCloud icon. Step 5. After a while, the movie will be downloaded. The downside to this is that you have to redownload your movies which may take a while if you have slow internet speeds. 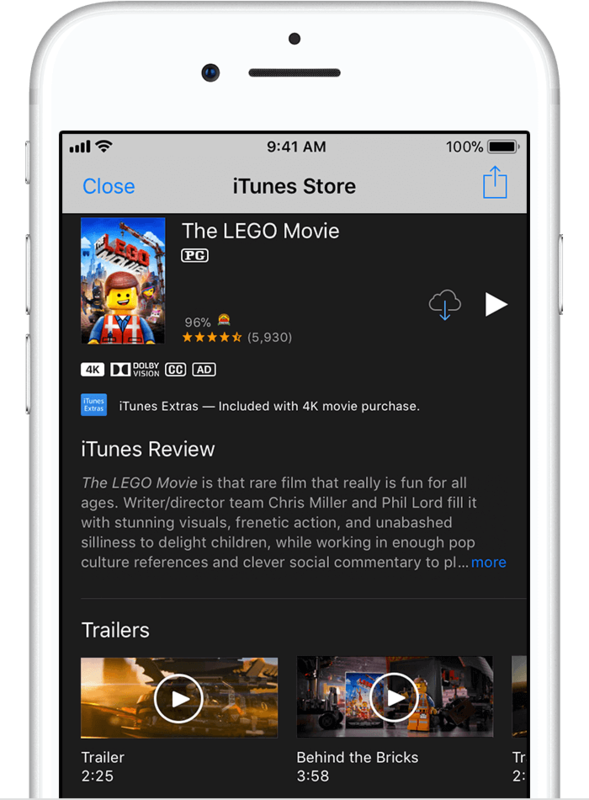 Given how problematic iTunes can be sometimes, you might be wondering how to download movies to my iPhone if iTunes suddenly stops downloading. To fix this problem, follow our guide below. Step 1. Launch iTunes and sign into your Apple account, if you haven’t already done so. Step 2. At the top of the program, click on “Account > Check for Available Updates”. Step 3. You’ll be prompted to enter your account information again. Step 4. Any iTunes downloads will automatically restart. If you’ve run into problems with downloading your movies on your iPhone, follow the steps below. Step 2. From the taskbar at the bottom, tap on “More > Downloads”. Step 3. You may be prompted to enter your Apple ID information. If you are, do so now. Step 4. Any paused downloads will be shown on your screen now. Tap on the arrow to restart the download. iTunes quit before download finished. Your iPhone or computer restart ed during the download. Internet connection was so slow. Third-party security software or firewall blocked the download.